I often get asked various questions about the use of different 3D monitors for building a multi-monitor setup for stereoscopic 3D gaming – 3D Vision Surround as well as for non-3D use, the normal Surround. And while the 2D surround mode is much more forgiving to the kind of displays being used, when talking about stereoscopic 3D gaming the requirements for building a 3D Vision Surround setup are much more strict. 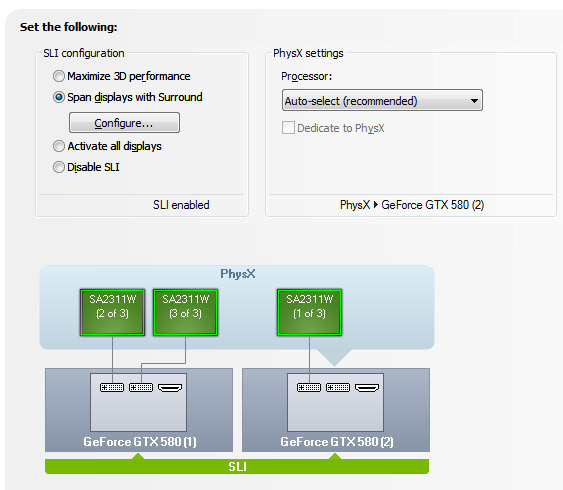 You are required to essentially use three 3D-capable monitors from the same model in order to ensure perfect compatibility and best experience and this is what Nvidia recommends, however sometimes this can be a problem, or you may find a more practical and cost effective way to get a 3D Vision Surround. So what are the options and what will work and what will not, that is exactly what I’ve wanted to test this time trying to use three different 3D Vision-ready displays in a 3D Vision Surround setup and I’ve found out some interesting things that I’ll share with you. I have multiple 3D-capable monitors available that I use for testing, from different generations and with different features, however I don’t have three exactly the same models to use them as a 3D Vision Surround. It is not that I don’t like 3D Vision Surround, just haven’t gotten to the point in building such a setup for constant use, so far only making temporary setups for testing various things. And since the initial introduction of 3D Vision Surround as a solution Nvidia has greatly improved it and I believe that sooner I’ll have to do a permanent setup for testing. But for now and especially for the purpose of this article I’ll be using three different 3D Vision-ready monitors as this will give me all the possible scenarios to test various things in regards to compatibility between the different displays used for building a 3D Vision Surround setup. Now, the requirement to use three exactly the same 3D monitors for 3D Vision Surround is based on a few important things. First the external features of the displays are the same – the same size, the same height, the same bezel size and all of this is very importing when you are arranging the three displays to form one big screen together. Then comes the LCD panel used in the 3D monitors, when it is exactly the same it means that you’ll be getting the same color reproduction, level of brightness and response time across all the displays. And specifically for the proper stereoscopic 3D experience there is also the importance of the same level of crosstalk/ghosting you’ll be getting across all the displays and not more on some and less on the other. You should be aware of the fact that even identical models of monitors can have some slight variation in the image they display, so a bit of fine tuning even in this cases can help in getting even better overall experience, making all three displays seem like a one wide display. So what happens when you connect three different 3D monitors and enable 3D Vision Surround mode? Actually you can do that, even though the drivers will detect that your 3D monitors are different models, as long as they support 3D Vision you can go over the 3D Vision Surround setup wizard and enable the technology. It is a completely different thing however if things will work properly after that in stereoscopic 3D mode, because the 3D Vision detects the first monitor connected as the one being used and assumes that all three 3D displays are the same make and model. So if it is the Planar you will not be able to use anything else besides 3D Vision discover mode, unless of course you plug in an external IR emitter for the glasses, and that happens even though the other two displays actually do have built-in IR emitters. In this situation if you plug-in an external IR emitter and you run something in stereoscopic 3D mode only the Planar and Acer monitors show 3D and the Asus monitor remains blank when in 3D mode. If you connect the Acer 3D monitor first then when you activate stereoscopic 3D mode you’ll see that the Asus will show in stereoscopic 3D mode and the Acer and Planar monitors will show 2D image. If the Asus 3D monitor is connected first the Planar shows the image in 3D mode with a serious level of ghosting and the Acer 3D monitor shows only 2D image, regardless if you use the built-in IR emitter or an external one. So apparently neither of these variants is a good choice, though if you have the center display running in stereoscopic 3D mode and the two side ones show the same image in 2D it is not that bad as actually with your peripheral vision you can hardly get depth information anyway, so it may be a kind of an acceptable compromise (if you rotate your head however things aren’t going to be that good). The next step was to play a bit with the monitor identification information using different EDID override drivers in order to trick the OS and the video drivers that we actually have three exactly the same 3D capable monitors available and connected, even though they are completely different in reality. Using Planar EDID override driver for all three displays requires the use of an external IR emitter, but the good news is that all three displays actually work in stereo 3D mode and there are no issues with more than usual level of ghosting shown on any of them. It seems that in this case the Asus display does not make use of the 3D Lightboost mode and works in some kind of compatibility mode with the other to displays, the image you get from it is less brighter this way, but it still works properly. Moving to the Acer EDID override driver things get a bit messy using the built-in IR emitter – all displays show stereoscopic 3D image, but only the Asus shows proper image, the other two displays have a lot more ghosting – plugging an external IR emitter however resolves the issue and you get the same good results as with Planar’s ID. And finally using the Asus EDID override driver for all three monitors makes them work in stereoscopic 3D mode, but only the Asus shows proper image, the other two have way more ghosting than usual, regardless if built-in or external IR emitter is being used. So what is the conclusion of all this testing with mixing and matching different 3D monitors? For best experience you should stick to the recommendation to use three exactly the same 3D monitors, but if that is not an option, then you have a few somewhat acceptable alternatives available as well, but not recommended unless there is really no other choice. Either using the two side displays in 2D mode and only the center one in stereoscopic 3D mode, if the center one supports 3D Lightboost technology. Or going for a some kind of backwards compatibility mode for 3D monitors supporting 3D Lgihtboost technology to work the same way as older models that don’t support the tech, the opposite is not possible however. But these two alternatives are available only if mixing older 3D Vision displays with newer ones that support the 3D Lightboos tech, for example two Acer HN274H with one Acer HN2674H B, making all the three work like Acer HN274H without the 3D Lightboost active for example. If you have only older generation or newer generation 3D monitors with 3D Lightboost support, then things are actually much easier for you, though with serious physical differences matching them in a 3D Vision Surround setup may still not be that good idea. And here I can now answer that a 3D Vision Surround setup using one BenQ XL2420TX with two BenQ XL2420T monitors should be something that you can make work as these two models are essentially the same with some of the extra features in the TX stripped from the T model, so this way you can save some cash and still get a great 3D Vision Surround setup. Actually starting with drivers version 304 (currently only beta) Nvidia officially allows you to mix different 3D monitors supporting 3D Lightboost without having to resort to any workarounds, so mixing BenQ XL2420TX with two BenQ XL2420T monitors should be working directly with these drivers without the possibility of having issues that may be caused by EDID overrides. Mixing and matching Asus VG278H and Acer HN274H B is also possible with the latest beta drivers, though this may not be that good idea as mixing the two versions of the BenQ that are almost exactly the same. The only problem with being able to mix a BenQ XL2420TX with two BenQ XL2420T monitors in a 3D Vision Surround setup is if you live in Europe for example where the TX version is still not available. * The superscript numbers in green and red show the change as compared to the specs of GTX 590. So, looking at the specs it is pretty much two GTX 680 GPUs on a single card, though the operating frequencies of the GPU (the normal and the boost one) are lower than on the GTX 680, but that is something needed in order to fit in the 300W TDP. And the GTX 690 should is able to handle quite a bit of overclocking like the GTX 680, so you should be easily able to compensate the difference in frequencies. So if you still haven’t upgraded to GTX 680, you might want to consider going for a single GTX 690 instead of two GTX 680s in SLI, or why not even two 690s in Quad SLI. The question here however is what would you need a GTX 690 for when talking about stereoscopic 3D gameplay, clearly if you plan to play games in a triple display setup using 3D Vision Surround going for a GeForce GTX 690 (or two GTX 680 for that matter) is a must, even though a single GTX 680 is capable of supporting a 3D vision Surround. For a surround setup you not only need the outputs, but also the performance to back the tripled resolution as compared to using a single 3D display, and while a single GTX 680 can do a very decent job, playing at maximum detail levels on more demanding games would be more comfortable with two cards or the new Dual-GPU solution. The GeForce GTX 690 is also a great choice for everyone thinking about playing on 2D displays with higher resolutions such as 2560×1600 with maxed out graphics settings. The recommended end user price of the GeForce GTX 690 is $999 USD, and the first cards are expected to be available starting May 3rd in limited quantities, with more coming up on May 7th, so just a few more days left. And considering the price is pretty much the same as of two GTX 680 cards, the GTX 690 could indeed be a good alternative, but lets see some in-depth reviews of the card first before making the final decision as it has only been just announced from Nvidia and there are no reviews available yet. Unigine has released a new version of their popular DirectX 11 benchmarking software called Heaven, a piece of software that can put significant load on your hardware, no matter how powerful it is. 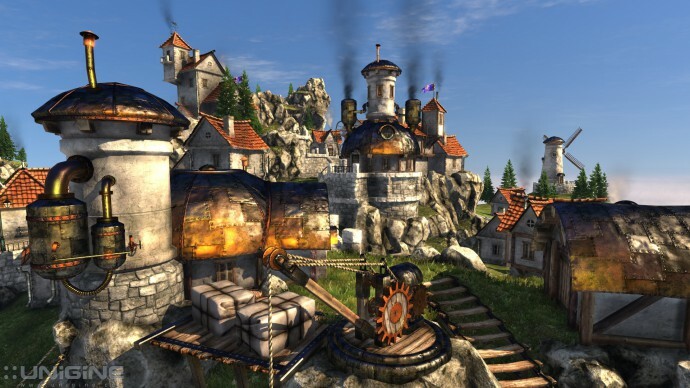 The Heaven benchmark is one of the best looking benchmarks that can also take advantage of the latest graphics technologies such as tessellation and stereoscopic 3D support. The newest version of the benchmark builds on top of that and ads some new features among which is an enhanced 3D Vision support (already introduced a while ago) as well as an improved support for multi-monitor configurations including the introduction of support for the Nvidia 3D Vision Surround setups (multi-monitor stereoscopic 3D). Of course the Heaven benchmark also supports multiple other stereo 3D modes besides 3D Vision, it can already work in anaglyph 3D mode or Side by Side, even iZ3D monitors are supported. There is a free basic edition of Unigine’s Heaven benchmark that you can download and use and the commercial pro version of the software only adds some extras that might be of interest to professionals using Heaven for serious benchmarking. It is interesting to note that the Heaven DX11 Benchmark software is based on the company’s Unigine graphical engine, meaning that all that you see in the benchmark can be realized in an actual game with the game engine, including stereoscopic 3D support. And quite recently Unigine have also released a game of their own based on that engine that also supports stereo 3D, the game is called Oil Rush. If you haven’t seen it already you are welcome to try it out, it comes with a very good stereoscopic 3D support and although there are some minor things needed to be fixed the game still looks very nice.